Take control of your rehab. A big part of what makes recovery from knee replacement or ACL surgery difficult is the loss of quadriceps strength. In fact, most patients lose over 60% of quad strength after knee surgery, which can prolong rehab time — and more importantly, prevent you from getting back to a normal, active life. Quadriceps atrophy – or the weakening of your thigh muscles – is a common but overlooked result of knee surgery. This weakness is caused by your inability to use your knee before and after surgery, as well as the physical impact of the surgical process. As your muscle atrophies after surgery, the communication between your nerves and muscles becomes hindered, limiting your ability to recruit your quadriceps and weakening the signal itself. Our neuromuscular electrical stimulation (NMES) solutions are designed to help speed up the recovery process, with an emphasis on comfort and convenience—so you can work on your rehab outside of the doctor’s office from home, work, or just about anywhere else. The e-vive system for total knee replacement (TKA) patients consists of a conductive garment that works in conjunction with our controller and smart phone-enabled app for comfortable, consistent at-home muscle activation. 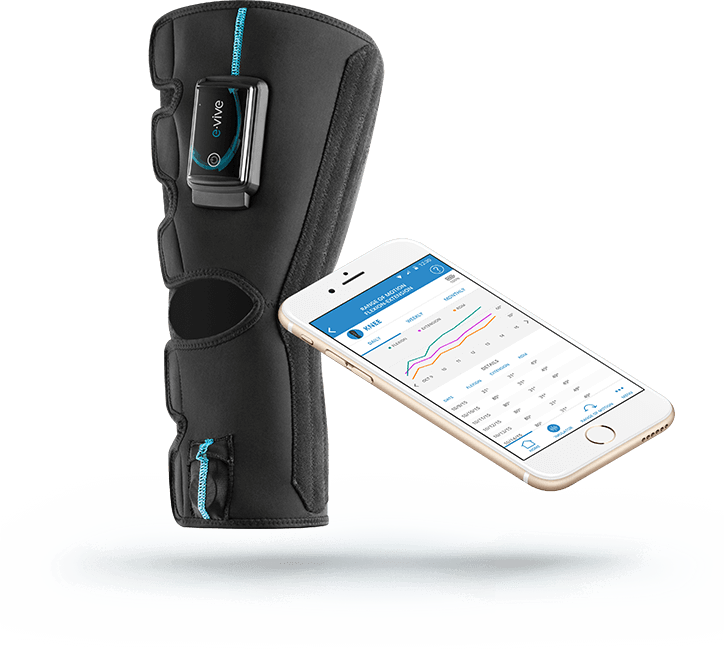 The e-vive system for ACL patients includes a brace, controller, conductive garment and our exclusive app which allows you to control your muscle activation using virtually any smart phone. Use the button to complete your e-vive experience survey. Get answers to FAQs, watch help videos, and more.